India’s Coastline Is Now ‘Extends’ From Seychelles To Indonesia: India and Indonesia have agreed to upgrade their ties to the comprehensive strategic partnership as in the two countries signed the 15 agreements including one on defense cooperative after extensive talks between Prime Minister Narendra Modi and Indonesia President Joko Widodo in Jakarta. The two leaders highlighted potential areas of cooperation in marine, economy, and socio-culture as well as discussed regional and global issues. The highlight of Prime Minister Modi’s Indonesia visit, strategically speaking, was the military access India got to the country’s Sabang port. That adds to us growing naval heft in the neighborhood. 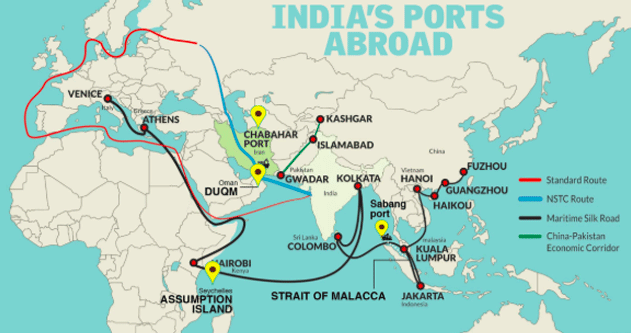 With this, India now has access to four essential ports abroad. It is position in the mouth of Malacca Strait makes it crucial. Malacca Strait is the main shipping lane between the Indian Ocean and the Pacific Ocean and is one of the busiest sea routes. The deep-sea port deep is enough for the submarines too will help to counter China’s rising maritime which is influencing on that place. India is gaining military accessing to the port on Oman’s southern coast this year. Duqm is on the northwestern edge of Indian Ocean. It provides easy access to the Red Sea. On paper, this is purely an infrastructure project. The agreement had to be revising due to political opposition in Seychelles, but broadly it signals a step forward for India’s strategic interests. So, these are the points to describe on India’s coastline is now extends from Seychelles to Indonesia.